Wells are cut in a gel and antigens and antibodies are added. Antigens and antibodies diffuse in the gel toward each other. Where antigen A and anti-A antibodies meet in optimal proportions (1), a line will form. A is the same in both wells, so the two lines will fuse where they meet because all of the antigen and antibody is cross-linked in the precipitate. This is a line of identity. Lines for antigens B and X also fuse (2), indicating that they are the same antigen. Crossing of lines of precipitate (3 and 4) indicates non-identity. Antigen A is different from antigen B and antigen X. The lines cross because antigens and antibodies are not cross-linked and they continue to diffuse without producing a line of precipitation. A spur formed at (2) indicates partial identity between antigens B and B'. They share some epitopes recognized by the anti-B' antibodies. Figure 17.5 Double Immunodiffusion Double immunodiffusion in gel can detect antigens that are the same, or partially the same, as recognized by antibodies in the serum. Protein antigens are separated by electrophoresis (movement through an electrical field). A trough is cut in the gel and antiserum containing a mixture of antibodies against the antigens in the gel is added. 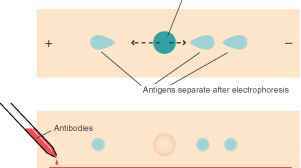 Antigens and antibodies diffuse toward each other. An arc of precipitate forms where antigen and antibodies meet in optimal proportions. Figure 17.6 Immunoelectrophoresis Permits Identification of Antigens in a Mixture Electrophoresis is used to separate the antigens; then, immunodiffusion is used to identify them. of antigen to give an estimation of the amount of antibody present. The procedure is essentially the same as for precipitation, except that the antigen is composed of particles instead of soluble molecules. It is possible for soluble antigen to be used in an agglutination test if the antigen is first attached to red blood cells (indirect hemagglutination), latex beads, or other particles. Then, when antibody is added in the test, agglutination occurs and the reaction is much more easily seen than a precipitate of soluble molecules would be. Similarly, specific antibodies can be coated onto latex beads and used to detect antigens. Antibody-coated latex bead products are commercially available to test for a variety of bacteria, fungi, viruses, and parasites, as well as hormones, drugs, and other substances. The beads are mixed with a drop of serum, urine, spinal fluid, or other specimen. If the specific antigen is present, easily visible clumps will form. by electrophoresis before adding antibodies to identify the separated antigens. ■ What is the advantage of immunoelectrophoresis over radial immunodiffusion in gel, and vice versa? ■ Why can't a cross-linking lattice form when there is an excess of antibody? 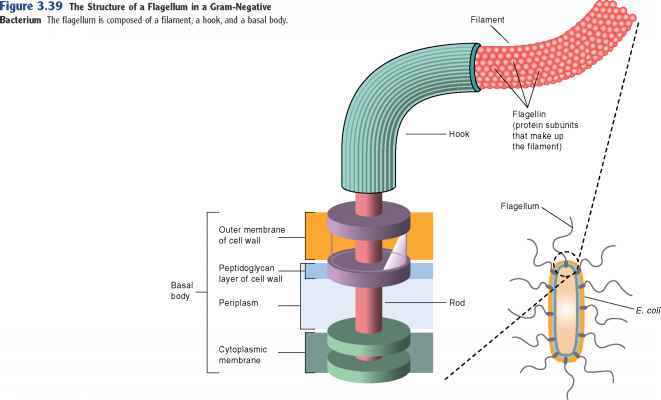 Hemagglutination is the clumping of red blood cells (see figure 17.7). Some viruses, such as those causing infectious mononu-cleosis, influenza, measles, and mumps, agglutinate red blood cells by an interaction between surface components of the virus and the red cell. Since specific antiviral antibodies inhibit the agglutination, antibodies to the virus can be measured by hemagglutination inhibition. 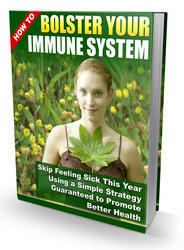 Serum is serially diluted and mixed with the virus and red blood cells. Dilutions of serum containing specific antibodies inhibit the usual agglutination of virus and red cells. The titer of antibodies is determined by the highest dilution ofserum in which agglutination does not occur.